Armed with MacGyver-like skills and the intuitive know-how to solve problems while on their feet, Nolan Mayrhofer and his team thrive on projects that require creative intervention. For instance, he says, Szolyd (pronounced “solid”) was one of the first companies in North America to be licensed to work with Ductal. “It’s such a sophisticated product, so different from anything else out there,” he says about Lafarge’s very flexible high-performance concrete, which his company markets as D-Roc. Mayrhofer says he was first inspired by concrete about 16 years ago. At the time, his company Stone Design was making mosaics, creating made-to-order art pieces and building furniture out of recycled pallets. Meanwhile, friends of his at Sunwise Systems, in Kamloops, British Columbia, were pouring concrete floors, tinting them with stucco pigments and etching insects on the surface with muriatic acid. “It was pretty progressive and I thought, ‘Wow. This is the direction I want to move my company,’” he remembers. He began attending trade shows to learn all he could about concrete and soon was promoting Stone Design as a concrete flooring company, offering a variety of services that included acid stains and rudimentary polishing. Slowly, the company evolved into the polishing company it is today. In 2003, Mayrhofer founded a second company, Szolyd, to branch out into different areas, such as precast landscape pieces and countertops. “Szolyd was always set up so we could design our own products and manufacture our own lines,” he says. 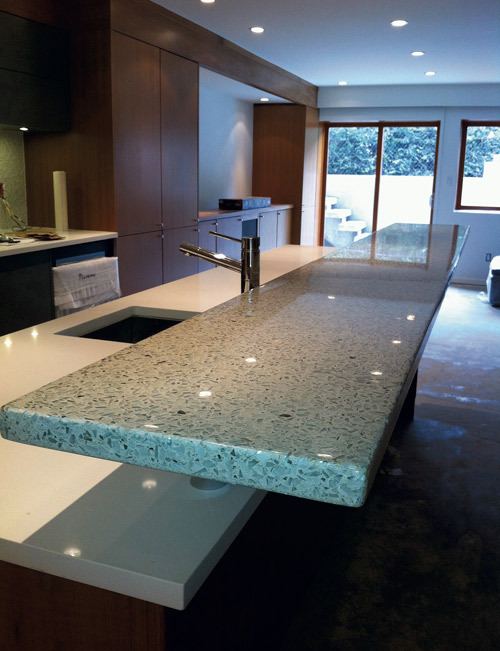 Almost all of the newer company’s work involves designing and precasting concrete landscape elements, countertops and tables. The designing is a team effort — he and his crew work with designers or design pieces on their own. Besides D-Roc, the company markets two in-house casting blends. Currently, the company employs seven people. They are continually testing new ingredients, refining formulas and building on existing technology to improve their products’ strength, durability and finish. Szolyd’s G-Roc is aimed at hard-surface architectural and furnishing artisans. It’s made from 85 percent recycled materials, with glass accounting for about 60 percent of the total weight, and can net contractors LEED points. In addition to G-Roc and D-Roc, Szolyd offers T-Roc, the casting mix it calls its workhorse. The mix can be polished or hand-troweled, precast or hand-packed to form countertops, architectural details and other concrete items. “T-Roc is our traditional mix,” Mayrhofer says. Szolyd also has used glass-fiber reinforced concrete (GFRC) on a basic level with a hopper gun, he says, but it’s ready to step up to full-scale GFRC batching equipment. Besides countertops, Szolyd’s work largely consists of benches, planters, signage and cladding for buildings. In particular, most of the current work involves large public or commercial spaces. One of Mayrhofer’s pet projects involves a process he calls “cradle to grave to cradle.” Szolyd is removing 80 tons of office cubicle glass from a 10-story building in Vancouver owned by KPMG, one of the largest audit, tax and advisory firms in North America, and recycling it to make concrete countertops for the building. Other projects include a variety of landscape pieces for the Little Spirits Garden in Victoria, a site where families can grieve pregnancy and infant loss. A staircase designed by architects at Perkins+Will for the firm’s Vancouver office features precast tread-riser combinations. A conference table for the Edmonton, Alberta, headquarters of Durabuilt Windows & Doors required 16 men to lift it in. An urban space outside the 2% Jazz coffeehouse in downtown Victoria features a solar-charging phone station set into concrete. On the flip side, “There are those happy accidents, where something wonderful happens, that are often talked about.” And seldom recreated, he says.